Sapporo Black Label is a typical Japanese lager, and one of the top-selling beers in Japan. 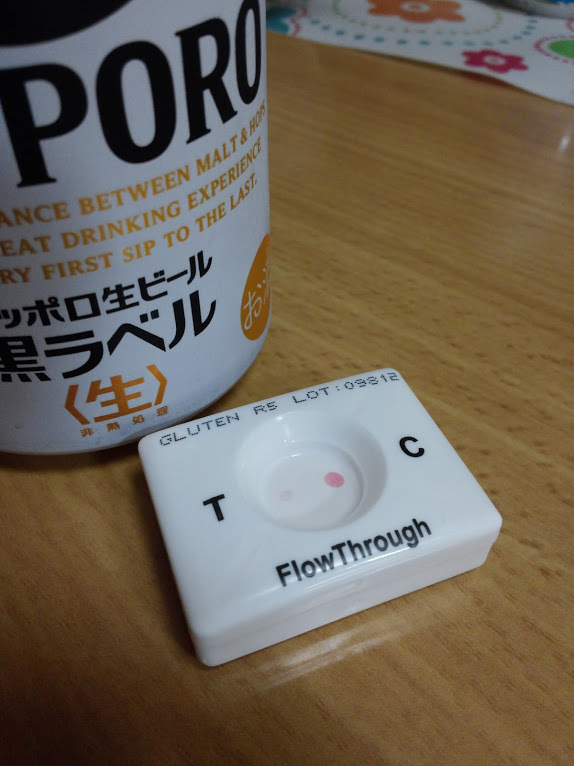 It contains not only malt and hops, but rice, corn, and starch, which gave me hope for a low- or no-gluten test result. I had also encountered anecdotal claims on the Web that Sapporo (no variety specified, just “Sapporo”) was gluten-free. 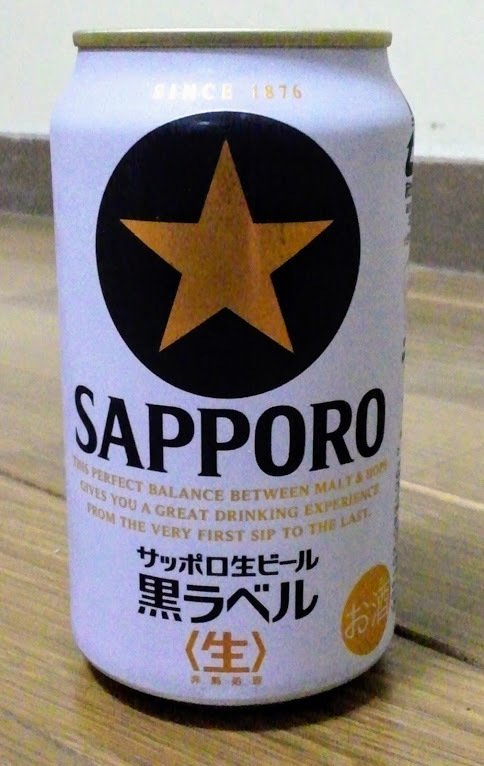 Indeed, if you order a “Sapporo” in Japan, you can expect to get Black Label. Let’s see how it tested. NOTE: this beer is completely different from the Sapporo Black product. Test result: There is a not-so-faint pink spot on the left side of the testing area, which is an indication of the presence of gluten. The pink spot on the right test area (C) is a control spot and indicates that the extract/sample is suitable, the test has been performed correctly, and all reagents are active. 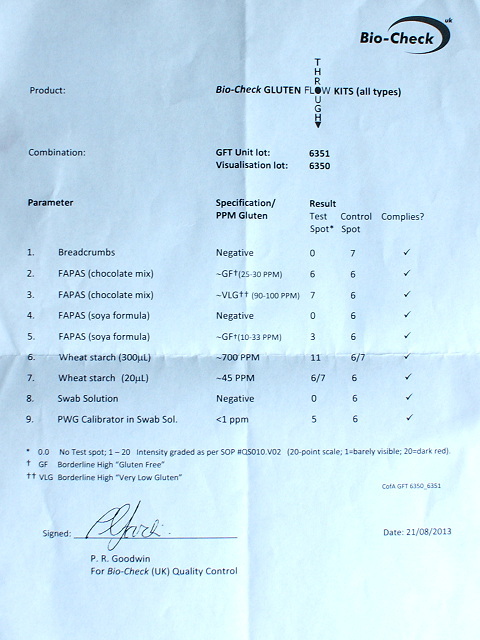 The gluten content of the sample can be estimated according to the intensity of the pink test spot. Despite the use of rice and corn in the brewing process, this sample of Sapporo Black Label seems to have a relatively high gluten content compared to other Japanese lagers I’ve tested. I purchased a 355ml bottle of Sapporo Premium today, 5% abv, made by Coopers, South Australia, under licence from Sapporo. Here is hoping it is low gluten. Well last evening pre dinner I tried the Sapporo Premium 5% abv, 355ml bottle, brewed by Coopers Brewery – the best Australian brewery in my opinion, supported by Adam on here. I chilled the bottle well, opened it up and poured it into a 200 ml Warsteiner Glass I have, good pour, decent head and carbonation, no bad aromas or after taste, caramel colouring. The taste quite smooth but full flavoured. To my palate. 30 hours on I have had no Coeliac reaction which is great. Not that I am going to push my like 2 or 3 a week will be the max. I have tried to find out the ingredients, but no luck so far, nothing on Cooper site and Sapporo site deals with Japanese product. Thanks for your interest mate, stay safe, it is a jungle out there with all those beers waiting to attack us !!! lol. Fantastic Les – good to hear that everything is OK. And yes don’t push it. Good to see you back here. Yes I’ve had many of Coopers Sapporos and have always been fine after. I’ve found Coopers Kronenbourg 1664 to be okay too, and Coopers Light (basically lower alcohol version of Coopers Lager). Coopers are very reliable and consistent. There’s only one brewery unlike a lot of mass produced Australian beers that brew in “various loacations around Australia” (have a look at their labels next time you’re at a bottle shop). Hi Adam, Coopers is the best brewer in OZ IMO. Any beer they make is quality. Used to love ye olde Coopers Stout, mothers milk, grow babies in it, put it in your sandwiches, it was/is that that good. You’re right about the stout. Unfortunately we can’t have it. My uncle was here in Adelaide recently, visiting from Rochdale in England, and asked “do they still make Coopers Stout?” He hadn’t had it for 45 years! I trust your Uncle sampled a couple of Coops Stouts then. Have you found any black beer suitable for coeliacs, like 20 ppm or below? I would love to know if the Sapporo Black Label as tested has the same ingredients as the Sapporo Premium made under licence by Coopers in South Australia. Coopers won’t answer my E mail re same.